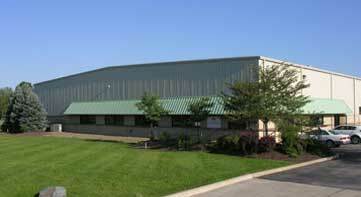 IMPERIAL is a full service stamping die design, engineering, tool building, and stamping manufacturer. We specialize in small to medium size progressive stamping dies for complex parts. We can handle dies up to about 6 feet long. Simpler dies are also done. 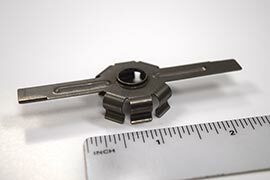 Our dies are “Class A” or to your specs. 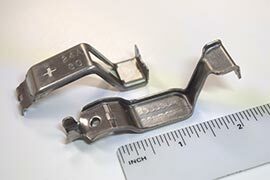 All retainer blocks are hardened A2. 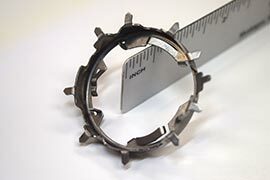 Cutting and forming inserts are hardened D2 or better and can be hard surfaced as needed. 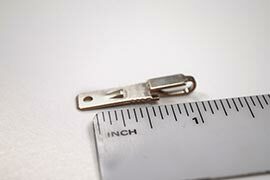 All inserts are serviceable and replaceable. Dies are custom designed to produce your part in the best way possible. Not only to make the part, but also to limit or eliminate secondary operations and have a die that runs well with minimal down time. Options may include in-die tapping, nut insertion, adjustable forms, and sensors to improve performance. 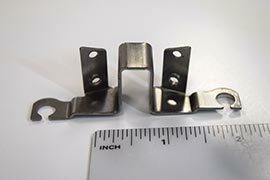 If you need finished parts for your product our stamping department can run them for you and ship to your schedule. 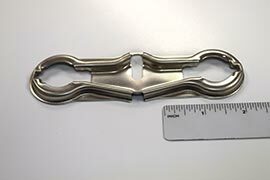 Finishing can include de-burring, heat treating, plating, etc. All our work is done to the highest quality and guaranteed to meet your requirements. They can do some of the things we do cheaper! What they cannot do is beat our quality and service. Our dies are engineered and built better. They will run longer with reduced down time and give you a better part. Our delivery time is less and communication much easier with fewer errors. We can make last minute changes quickly. Yes, it may cost more initially. But the savings over the life of production can be significant. And you’re supporting the U.S. economy.